Author Al Patterson started collecting vinyl in elementary school. Hes since amassed a serious collection and deep knowledge of instrumental-only Hip Hop records. Some are "performance" records that were pressed in very small numbers for use exclusively by the MC or groups DJ during live shows, while others were commercially released. These instrumental records, whether from the obscure depths of the underground or well-known Hip Hop acts, are cataloged alphabetically by artist and accompanied by a photograph of the records label. Each entry specifies the artist, title, format, producer, label, year, and catalog number as well as notes and anecdotes about the disc. Many are very rare and totally unknown. All have stories attached to them. 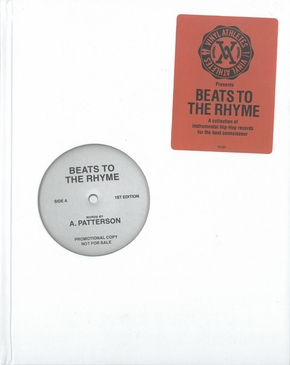 Patterson once asked Raekwon (Wu Tang Clan) to tell him more about a certain rare pressing. Raekwon replied "I thought they destroyed all of those." Many of these records were pressed in such small numbers that theyll never be seen outside the pages of this book, but it doesnt hurt to look. Author Al Patterson started collecting vinyl in school. He's since amassed a serious collection and deep knowledge of instrumental-only Hip Hop records. These, whether from the obscure depths of the underground or well-known Hip Hop acts, are catalogued alphabetically by artist and a photograph of the record's label. Each entry specifies the artist, title, format, producer, label, year and catalogue number as well as notes and anecdotes about the disc. Many were pressed in such small numbers that they'll never be seen outside the pages of this book.